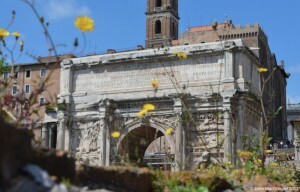 As part of my MLitt studies here in St Andrews, I spent a fantastic and thoroughly rewarding two months studying out at the British School at Rome on their annual ‘City of Rome Postgraduate Course’ led by Dr Robert Coates-Stephens. The course was divided between working on individual research projects and going on site visits around Rome. The site visits covered the ancient city in depth while our itinerary also reflected the different research projects of the group. The composition of the course allowed us to revisit different areas of the city several times as we progressed in a broadly chronological manner from considering the Republican city through to the Late Antique period. This structure provided a fantastic grounding from which to build a picture of the ancient city’s development across the centuries. The course provided us with an unparalleled opportunity to access sites including the Tomb of the Scipios, the House of the Griffins on the Palatine Hill and the extraordinary Casa Bellezza discovered underneath a house on the Aventine Hill. A visit to the British School’s ongoing work at Portus additionally allowed us to see an exciting ongoing excavation project. These visits were supplemented by a seminar series hosted within the School through which we had a fantastic opportunity to hear and spend time with scholars with a variety of research interests. My research project in Rome initially focussed upon a series of statues of the Vestal Virgins that were displayed in the House of the Vestal Virgins in the Forum. Shadowy figures that are known predominantly from sparse ancient source references, the project considered what the composition of the statues might tell us about how the Vestal Virgins were viewed within Roman society. Material viewed on our visits around Rome further encouraged me to expand my research considerations to compare these statues with depictions of the Vestals on monuments such as the Ara Pacis and Cancelleria Relief B. I drew comparisons and contrasts between the representation of the Vestals as individuals in the House of the Vestal Virgins and as a collective on imperial monuments. The course was an incredible and unique opportunity. Feedback from Robert and from course mates through discussions and presenting research in progress seminars provided a really supportive environment through which to develop and shape the direction of my research. Staying in the School alongside artists and scholars from many disciplines likewise provided a stimulating and enjoyable environment in which to live and work, with many helpful conversations taking place around the dinner table in the School. The site visits stimulated the development of my research both within the scope of the course’s project and beyond and it was really inspiring to have the opportunity to undertake research ‘in the field’. I found it a fantastic experience in preparation for beginning my PhD here in St Andrews and cannot thank Robert and the British School at Rome enough for a unique opportunity.